A read-only CD-ROM and accompanying booklet (in Spanish) of 61 pages with 60 colour photos and 4 b&w. Price 1724 pesetas (c.£6.80). Order details from <www.fbarrie.org> ISBN 84-89748-58-6. Minimum configuration Pentium 100Mhz and 8Mb RAM. Sound card required. 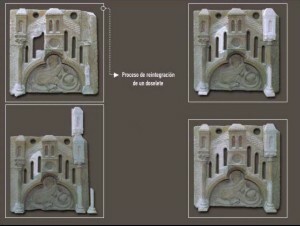 This is the story of the thirteenth-century stone choir stalls in the cathedral at Santiago in Galicia in north-west Spain. The stalls were constructed under the supervision of one 'Maestro Mateo' and completed in about the year 1200. Four hundred years later the stalls were demolished and replaced with a wooden version when liturgical changes demanded new seating arrangements. Fragments of the decorative stonework were then re-cycled, dumped, buried and dispersed and largely forgotten until 1900 when excavations began in the cathedral. New discoveries enabled small sections of the choir to be reconstructed in the 1960s and 1970s. The major group of stonework was then recovered in 1978 (photographs of excavation work in progress reveal this to have been a robust operation [see figure 1]). This was followed by publications and the financial support of the non-profit-making Fundación Pedro Barrié de la Maza in 1995. By 1999 the process of consolidation and restoration of 17 'seats' was complete, new pieces in the possession of the cathedral combining with the old to 're-create' the original. The results can be seen in the museum of the Cathedral of Santiago. The CD-ROM reviewed here is spin-off from that reconstruction project. 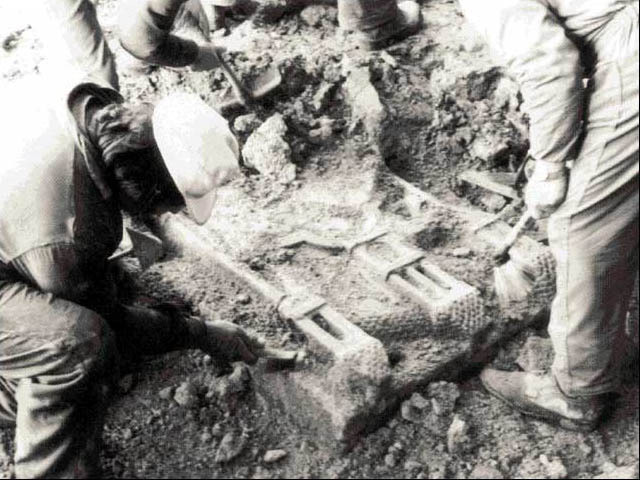 Figure 1: Excavations in 1978 in the Obradoiro of the cathedral at Santiago. Numerous fragments of the choir were both discovered here and later during building works, both in the cathedral and in the town. Let's look first at the contents. 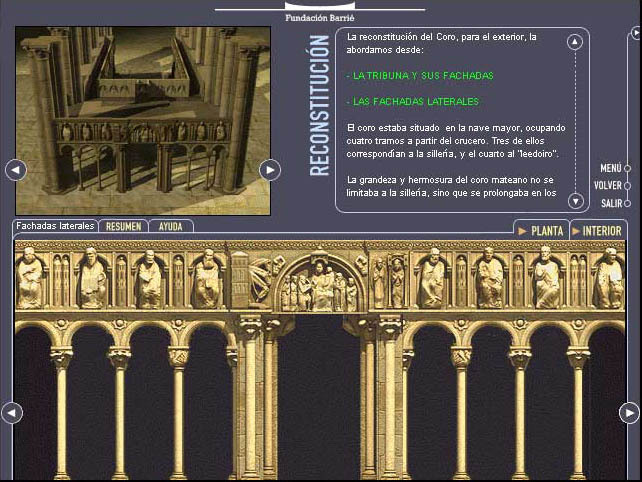 After brief, and apparently unavoidable, publicity for the funding body, we are accompanied by a spoken commentary (in Castilian) and monkish incantations to a main menu screen with five sections: history, destruction, reconstitution, iconography, reconstruction. All this is stylish and quite beautifully presented. 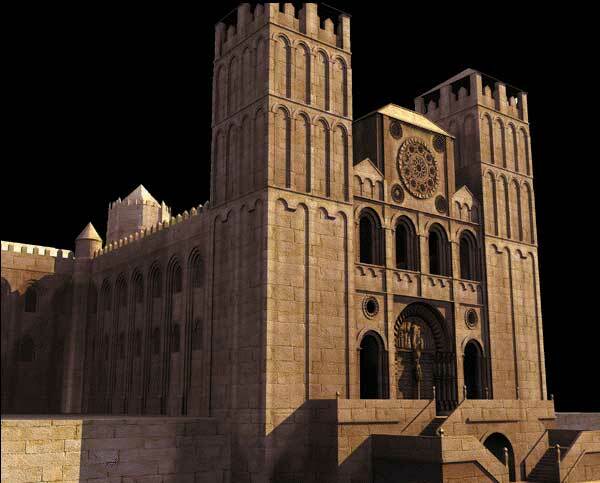 The history section includes some very detailed evocative 3D reconstructions of the exterior of the Romanesque building [see Figure 2], a plan, and a magnificent 3D reconstruction of the choir itself [see Figure 3]. There is the usual 'moody' lighting [see Figures 4-4a], so typical of this sort of presentation but the results are truly impressive. In fact, these are the best I have seen. For those seeking more detail, there is one link into a lengthy academic bibliography, though the only English reference is the Metropolitan Museum of Art catalogue for 'The Year 1200', published thirty years ago, and another to a simple chronology chart listing the key events in the cathedral's history. I assume from the commentary and structure of each section that the CD-ROM is aimed at the general public, if so then the cultural 'level' is appreciably higher than that which would be assumed in Britain. Figures 4 and 4a: The interior of the stone choir stall. Note the hierarchial spatial organisation designed so that the higher ranking clerics were seated in a slightly more elevated position. The destruction section is really about the dispersal of the stonework and here we see the first real use of the technology. This was all quite exciting! 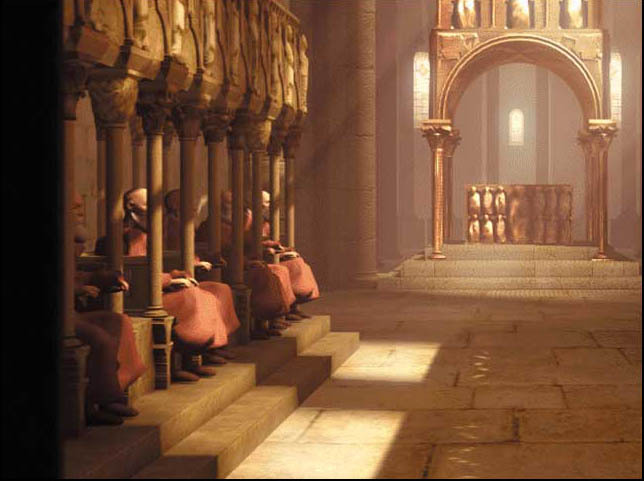 [see Figure 5] It took me a moment or two to get used to it but an angled 3D view of the choir allows the user to negotiate around the choir. As you do so the close-up view of the architectural detail moves below. If you're not quite sure what you are looking at then there is a 'plan' button to click which highlights the relevant bit. There is also an informative text section with highlighted words linked to an architectural dictionary, just in case you are shaky on the distinction between a 'sofito' and a 'dintel'. The commentary can be turned on and off, and there are HELP buttons at hand. 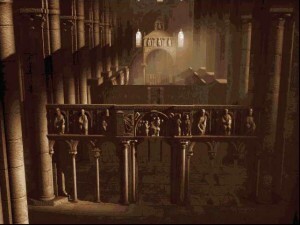 Figure 5: The viewer can 'walk' around the choir (top left) and then pick out sculptures for further details. The screens are well composed and easy to use. 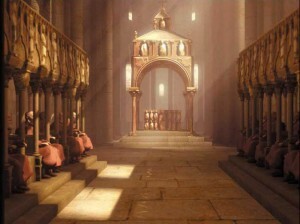 The next section, on 'reconstitution' explores in detail the architectural design of the choir. Again we can scout around the outside or inside of the structure, use the commentary, and learn from the text. The novelty here is that the images 'react' to illustrate the commentary. Thus, when we learn about the proportions of arches and figures while they are highlighted or bounce out of position. There is useful educative element to this, though my commentator was inexplicably cut off in mid-flow. The third section is iconography. Here again we can navigate around the choir and, by clicking on the figures, learn about their iconography [see Figure 6]. The text is informative, if a bit small. By clicking on different parts of the reconstructed stall the commentary and/or text reveals where the fragments were found. This information would have been better in an earlier section and could have been developed further. Most of the stone sculpture has survived in one form or another. It seems that while some pieces were lost, many were re-cycled in new decorative schemes inside and outside the cathedral and subsequently lost limbs and heads during the Carlist Wars, others found their way into private art collections. Some fragments which had made their way into other churches in the region were returned for incorporation into the reconstruction. A handful are in the National Museum of Archaeology in Madrid though exactly how they got there is only revealed in the accompanying booklet. Figure 6: Iconographic details for one of the biblical figures, noting details of posture and dress. The final section is 'reconstruction'. The format here is quite different and takes the form of a slide show charting the recent history of the recuperation of the choir. There are fewer glossy interactive elements but this introductory section leads then into more detailed sections with photos of the reconstructions [see Figure 7] and information about the reconstruction process. This takes the form of text linked to images (sometimes rather poor), often arranged in sequences to show fragments being restored. 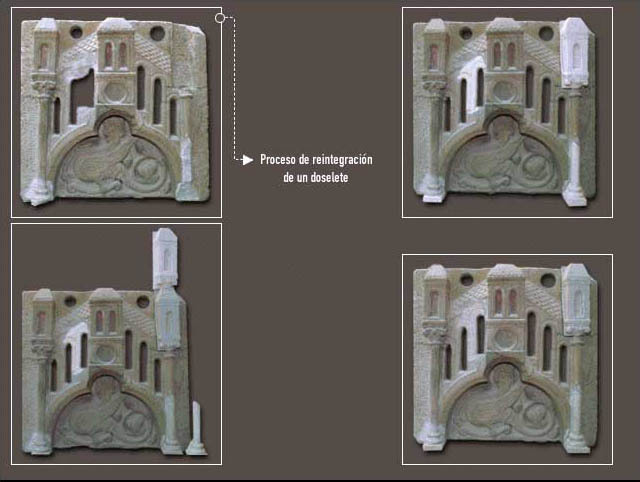 Figure 7: A small number of pieces survived intact but many more were damaged and required restoration. All the procedures used are reversible. 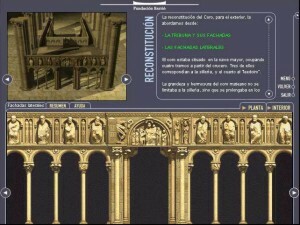 The 'reconstruction' was finally completed in June 1999 and is now on display in the cathedral museum at Santiago. I am not sure how to use this CD. It's a curious blend of publicity banter, truly startling technological application, and erudition. It is too highbrow in theme and content to be of use to children or most young adults (though they could probably find their way around it rather better than the reviewer!). Then again there is not enough educational content to make it friendly to students. 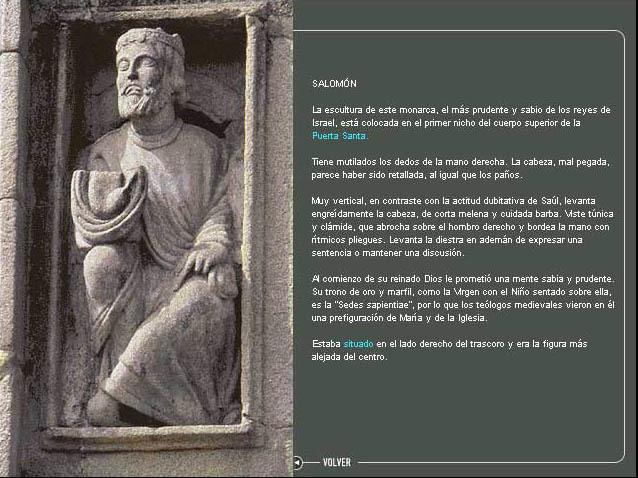 That would require references to other buildings, to the importance of Santiago in the medieval period, as well as a cultural, social and economic context for Romanesque architecture from both a Spanish and European perspective and some location maps. Even after an hour with this CD (and you could spend double that time at least) the lay person would have no concept of whether the thirteenth-century stone choir described here was exceptional or standard. Lastly, there is also a growing literature on liturgy and the use of space in churches and cathedrals which is omitted from the CD-ROM and would have added another dimension to the largely architectural and history of art thrust of the project. All this made me wonder just what was being celebrated here, the funding institution or Romanesque architecture? Perhaps a little of both but I suspect they take second place to another agenda - promoting Galicia and matters Galician. In fact, this CD-ROM is a rather good example of a kind of European 'cultural propaganda' which arises from a strong 'regional' political agenda. 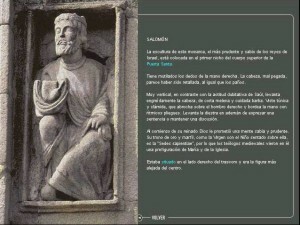 The benevolent private and non-profit-making foundation which funded the reconstruction and this CD-ROM has assets of 500 million pounds (this year it gave a million pounds to postgraduate research alone) and it uses its money specifically to promote the intellectual and heritage credentials of Galicia through education, research, cultural events and social work. Naturally, they hope to maintain a certain public profile and that means that at least some of their contributions will be eye-catching and glossy and tend to be something of a triumph of style over content. This is far from the worst example of its kind, but, nevertheless, it is one which raises some interesting issues. With such large sums at stake, one wonders whether archaeology or architecture has had best value from the investment. The last time I was in the Cathedral Museum in Santiago (in the mid-90s admittedly) it gave a good impression of a 1940s reconstruction with out-of-date displays and tired, antiquated labelling, so much so that the Spanish archaeologist I was with tried to hunt down the director to complain. I hope this has been put right now. But what about other Galician buildings which are at more imminent risk of structural collapse, the more typical vernacular buildings rather than the grander ecclesiastical or palatial monuments? Why should funding priority be given to an ecclesiastical building, albeit a very important one indeed? Was there any contribution from the Church or State? And if not, why not? What about all the architectural/archaeological research questions which presumably took second place to this project? These are uncomfortable political questions about the funding and politics of heritage which a CD-ROM like this is not intended to consider, though, ironically, by ignoring them altogether it tends to draw unwelcome attention to the issue. Finally, and here I may be on even stickier ground, there is the fact that such a reconstruction was allowed to go ahead at all. The British mentality towards reconstruction work is rather more unadventurous than the Spanish perhaps. If a similar case were to arise here, I could imagine long debates with English Heritage architects about whether or not a virtual reconstruction might or might not be enough, and to what extent actual reconstruction of this kind is mere architectural falsification. After all, the choir stalls cannot be appreciated within the setting of the cathedral interior, as they were once intended; they are de-contextualised now. Strangely then, their reconstitution in the cathedral museum in Santiago is as much a statement about our own attitudes to heritage today as it was in 1603 when the stalls were demolished in the first place.